At the end of 2012 I had a chance to try out a new-to-me product for marking up my materials – Lumber Crayons! I’ve used all of these, except for the laser (yet), and they have their pros and cons especially when it comes to working on rough lumber. The folks over at Kaufmann Mercantile contacted me and asked if I had ever tried a Lumber Crayon? My first response to anything with the word “crayon” in it is first skepticism. Then I remembered all those drawings on the walls my kids did! They were bright and easy to see, but they ALSO didn’t smudge very easily and more importantly, they didn’t penetrate deep below the surface either! So I said yes. Coincidentally, when the samples arrived, I was in middle of the Bedside Tables build and was just about to break down some the last of the rough lumber for milling. The crayons worked great on the rough surface of the wood and I had no problem writing and laying out lines and even component names for later where necessary. Eventually I even used the crayons to indicate where I still needed to work the surface of the rough table tops when handplaning them to their finished dimensions. I simply scribbled lines along across the surface and after planing I’d know exactly where I needed to concentrate my next passes. They come in three colors; red, yellow and black. These colors are all highly visible and work great with most species of lumber. I’d suggest using the red or yellow on darker species such as walnut and the red or black on light colored woods such as maple or poplar. The contrast of colors will make the lines stand out so much better when you’re laying out your cut lines for rough work. 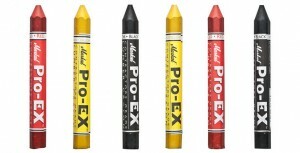 The crayons are a clay-based tool that’s described as being able to “write smoothly on metal, lumber, concrete, wood, and almost any surface too, whether wet, dry, frozen, or hot, from -20F to 150F. A great tool for woodworking, sorting firewood, building a shed…”. I definitely wouldn’t use them for fine layout lines on my projects due to the size of the tip, but for rough work and even writing things like component names and dimensions for when it’s time to mill the pieces, these lumber crayons working amazing and I imagine a whole box is going to last me a long time. 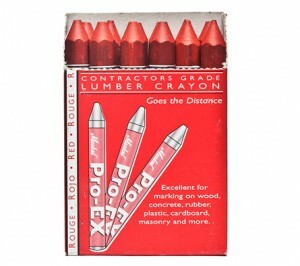 I suggest going with the red crayons because they show up equally well on both bright and dark colored species of lumber, and if you really want to be cool like me, get the Aluminum Crayon Holder. It’s a great accessory to keep the crayon from being broken, your hands from possibly getting discolored and it just looks cool. too. You’re right these are neat. These are commonly used for grading rough lumber. They let you make a quick swipe and have a distinct mark every time with no fuss. My sawyer has one with a wood handle, and I’m quite sure it would be possible to make your own handle. Come to think of it, I’m not sure how he sharpens it, or if he just turns it and advances it as it wears. I suspect the latter. that’s pretty much how I do it too…keep it moving LOL. Matt, any comments on how to remove the crayon marks after they have served their purpose? I’m thinking about how well solvents, sanding, or planing would work to remove the marks without interfering with the finish process. I know the description says something about being careful because they’re water proof, but even with a thin shaving of my plane it came right off and there was no issue. It stays right on top of the material, so I think even sandpaper can remove it without much effort. As for interfering with a finish, I haven’t tried anything yet, but I feel confident once it’s removed by scraping, planing or sanding there’s no issue. With my birthday being eleven days from Christmas, my family still requests a list so they don’t have to work too hard to come up with presents. This past year while trying to include some simple stocking stuffers, my mind went to marking walnut, one of my favorite woods to work with. Then I thought of my mother, who is a quilter and uses white fabric marking pencils to write on dark fabrics. Good suggestion! I bet they leave a nice line too. Thought you might like to see this use of lumber crayons here in the Northern Territory of Australia, taking them far beyond the marking-up they’re intended for. Their pairing with butchers paper (wide rolls of coarse paper formely used for wrapping meat)seems perfectly appropriate. The actual drawings on the gallery walls glow with the depth of color of the crayons, despite the passing of more than six decades. Like you, I’d not come across them before, and your site was among the first that came up when I searched lumber crayon. Very cool Stephen, thanks for sharing!